Mimi was born in Mol Belgium, educated in Brussels and has been a resident of Virginia Beach since 1976. Mimi is happily married with two children and two grandchildren. She is a self-taught artist who, after a one semester art class at Tidewater Community College in 1979, immediately started to pick up awards and prizes at the juried shows she entered. 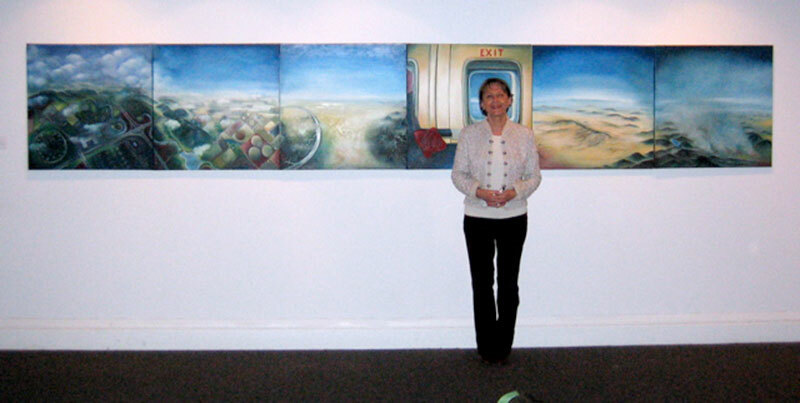 She has exhibited throughout the East Coast as well as California and has had solo exhibitions at the the Arts Club of Washington, The Embassy of Belgium in Washington DC, The Faculty Club of the University of Leuven Belgium as well as the Visual Art Center in Portsmouth Virginia. Her works are in private collections in Belgium, France, Spain, and the United States. Many of her paintings evoke the dreaminess of the Belgian surrealists. One critic writes of her capacity to “give a sense of wonder to an otherwise normal environment”. A Belgian critic calls her an “Intimate Surrealist“. She loves to draw attention to her native country by means of its rich cultural heritage and has lectured extensively on the art and history of tapestries. An art form that flourished in Medieval Flanders. By order of His Majesty King Albert II of Belgium she was knighted on July 21, 2006 for her work as Consul of Belgium for Virginia and West Virginia. Mimi was also received as an Officer in the Order of Leopold. Mimi enjoys playing classical piano, music is an important source of inspiration. Speaking of her own work the artist likes to quote Nietsche: “There are no facts only interpretations”. No part of this website may be reproduced or transmitted in any form or by any means, electronic or mechanical, including photocopying, recording, or by any information storage and retrieval system, without permission in writing from the artist.